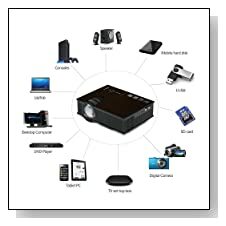 Are you looking for a low cost LCD projector that can play movies with decent quality? The new Xinda XDPT-1 IV0 could suit you well. The new model from Xinda comes with basic features and functions. Though the model does not sport a top-notch hardware and specifications, it covers most of the functions a premium model could offer. 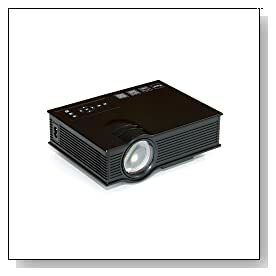 Definitely, this cheap LCD projector is not a right match for high-end Home Theater setup, if you’re on a tight budget, this model could do a decent job. Read our Xinda XDPT-1 IV0 Review to explore the mini LCD projector’s features and performance. Wide range of connectivity options that include VGA, HDMI and AV in. The model also supports media playback from USB flash drives and SD memory card. The device is capable of playing all common media file formats. Easy to connect with Laptop / Computer / DVD players / PlayStation. Built-in dual speaker. Image size up to 130-inches and supports HD resolution of 1920×1080 with 1000 Lumens brightness. Though the Xinda XDPT-1 IV0 comes with most affordable price tag, the company ensured complete set of features to the users. The portable projector has native resolution of 800×480 pixels and supports 1920×1080 HD resolution. The device can project bright, sharp and vivid images up to 130-inch size. The model supports both 4:3 & 16:9 aspect ratios, making it versatile for slideshows and HD movies. The model also sports best-in-class LED lamp that lasts for 20,000 hours. Thought the quality of projection is not comparable with high priced premium models, Xinda XDPT-1 IV0 did not disappoint us. Coming to design and built-quality of Xinda XDPT-1 IV0, the model is light and compact. The device feels sturdy and durable. The model is designed for projection distance of 4 feet to 12 feet. This cheap LCD projector is well suited for outdoor movie watching, thanks to its 1000+ lumens brightness. Though the device does not heat up much after continuous use, we noticed slight noise from the fan. However, it was not loud enough to distract us from watching movies. Overall, the new Xinda XDPT-1 IV0 comes with tons of useful features at a highly affordable price tag. Comparing this budget friendly portable projector with high-end products is injustice, but the projection quality was good enough for outdoor and indoor movie nights. If you are on a tight budget and still occasionally would like to watch movies on big screen, this model will meet your needs.